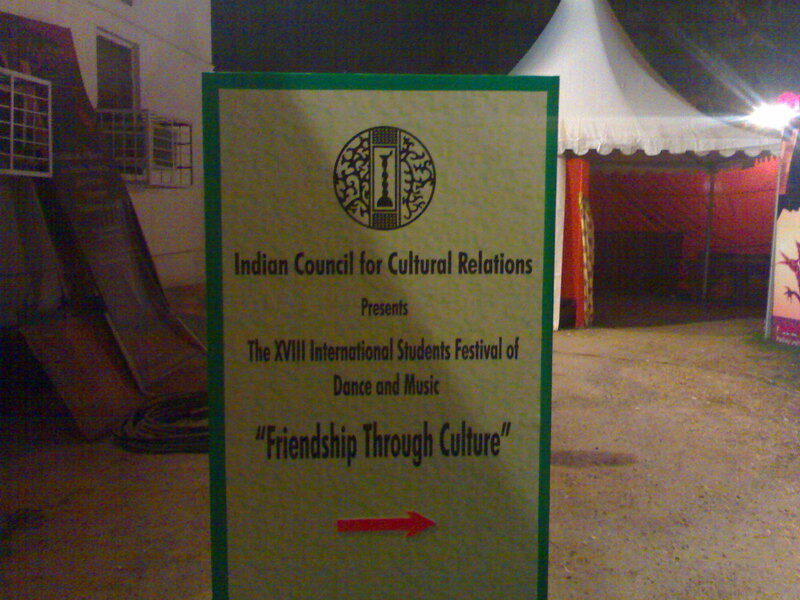 It’s my fourth year and every time I know that there is this ICCR dance and song festival held in Delhi. I knew that it is a festival aimed at bringing together the foreign students studying in Delhi together. But my tight schedule of submissions or sometimes due to sheer lethargy, I couldn’t make for until last weekend and yeah the reason was not that I wanted to go and sit there to see the foreigners dancing and singing but was there because some beautiful girls from Bhutan were performing. And I knew one of the five girls who danced at the tune of Nge semkha Shawei Metog Choe. It was a chilly early winter evening. Students from all over the universities of Delhi has gathered on the empty lawn. The stage was set up. 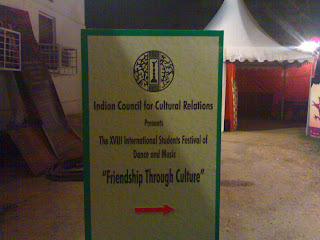 It read: Indian Council for Cultural Relations, International Student’s Festival 2010, “Friendship through Culture” People started filling up the empty chairs. I was sitting at the back row with my friends from my college. We had of course so many works to complete as it was my pre-final submission of Housing design on the following week. The programme commenced with the speech from a president of the ICCR. The item list consisted of dances and songs from eighteen countries. I have never had opportunities to be a part of such global society other than Facebook. It began with a joyous welcome dance and Emcee ushered in the group of students from Poland, Mexico, Tajikistan, Russia and Uzbekistan. Then there were this Indonesian boys and girls. They literally appeared so much into their cultures judging through their attires. And of course the guitars, drum, dancers, and the singer. I couldn’t make out what was the whole dance about. There was less dance and more singing by a one man in the mass. But the next item was of course something that I will never forget. I would admit that there is no need of understanding language if u like music. Those three girls from Tajikistan danced beautifully to the melodious tune. It was written on the item list that their dance was about the expression of love and separation. There was a section of boys at the corner among the audience. They danced along with excitement and fun. I never had a doubt that they also didn’t understand the lyrics but the tune and music, and ofcourse three beautiful girls made it worth dancing along and getting involved spiritually. We all literally were containing the moment. Then ofcourse on fifth item, there we were waiting with a pride and excitement for our Bhutanese girls to come out and stage the moment. As emcee announced the melodious song of love from this peaceful land, Bhutan, some of the guys in the front rows made a big shout. There was a big applause as beautiful girls from our peaceful land queued to dance. It was a great feeling to actually see Bhutanese dancing and becoming a part of such a global society. They just shook hard. It was magnificent, especially one girl at the corner. She just was too much with the rhythm of the music. The Russians were also too good. They just danced at the music. There was no lyrics, but the two beautiful girls made it so exciting. There was tribal dance from Sri Lanka, Mexicans describing the beauty of Indian woman, traditional victory dance by Afghanistan, Georgians, and many. It was a perfect weekend treat. And the show enlisted songs and dances of countries of northern Europe to Southern Asia. I never saw Mongolian dance until then. The show ended with the Indian song, Jai Ho. All the participants re-appeared in a sequence at the tune of Jai Ho. I believe Bhutanese women didn’t catch the eyes of audience than this appearance at the end did. They just walked in like a beautiful models. It was a perfect ramp walking. And the fact they wore Kira, I had a feeling that ramp walk in kira would be something natural and yet innovative fashionable not to mention the traditional quality of it. I still smile when I think of those Tajikistan girls, caravan Lankans, Russian women, and of course me sitting among so many people around the world and watching Bhutanese girls dancing from the audience. It truly was “frienship through culture”.